To preserve endangered rainforests in Indonesia, the World Resources Institute (WRI) has launched Project POTICO (Palm Oil, Timber, Carbon Offsets), a revolutionary approach to ecosystem management. Working with spatial analysis tools developed by Blue Raster, Project POTICO aims to divert planned oil palm plantations away from virgin tropical forests to already degraded lands, a swap that will prevent deforestation, reduce greenhouse gas emissions, and encourage sustainable agricultural development. Using the Suitability Mapper, Project POTICO is mapping degraded lands in West Kalimantan, Indonesia, to identify areas with high potential for sustainable oil palm expansion. This interactive web application produces a customized map of potentially suitable locations based on user inputs and a methodology developed by the WRI and its local partner Sekala. The custom maps can be used by government officials for land-use planning and zoning decisions and by oil palm companies to prioritize areas for project-specific field assessments. To create these custom maps, the application uses Esri ArcGIS Server Flex API and Pixel Bender for geoprocessing directly in the browser. 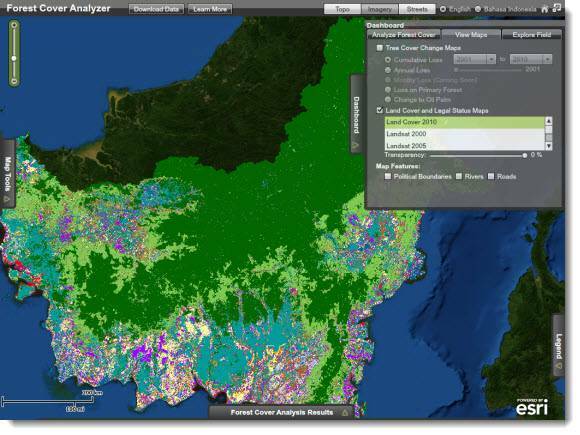 Blue Raster also developed the Forest Cover Analyzer, which supports Project POTICO’s efforts to monitor changes to the forest cover. 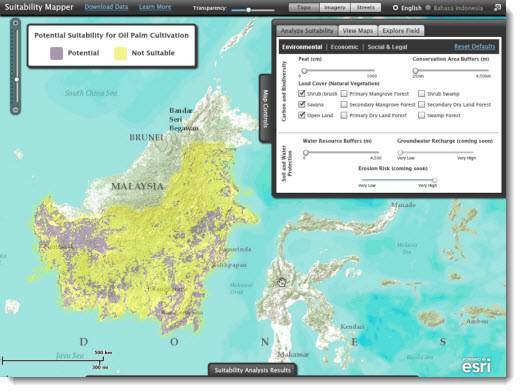 Using this application, government agencies and nongovernmental organizations can compare current and historic satellite imagery of Indonesian forests, and determine if oil palm companies are using degraded lands and meeting the standards of the Roundtable on Sustainable Palm Oil. In addition to using Esri ArcGIS Server Flex API, the application uses the Flickr API, allowing users to explore over 190 field points and panoramic images collected to verify maps. The beta versions of these two websites were presented at the Roundtable on Sustainable Palm Oil conference in Malaysia November 2011 and feedback collected from this event will be used to inform revisions to the public website to be launched in 2012. For more information on the project please contact beth.gingold@wri.org.